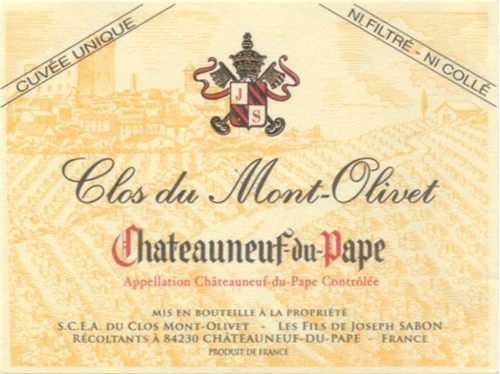 The 2008 Clos du Mont-Olivet Chateauneuf-du-Pape Cuvee Unique is very special because winemaker Thierry Sabon decided not to make his top blend, “Cuvee du Papet.” Instead, a large percentage of that great, limited old-vine fruit found its way into the “Cuvee Unique” blend. It's composed of 70% Grenache, 20% Mourvèdre and 10% Syrah. On the nose I get the most intoxicating and complex aromas of stewed black cherry, plum, ground cayenne pepper, Kalamata olive, earth, savory chocolate, and game-like meat nuances. 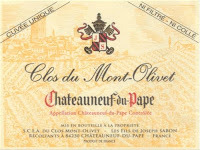 On the palate the wine exhibits the same intense complexity and is superbly thought provoking. Flavors of stewed cherry, roasted gamebird, plum, earth/mineral/chalk, rust-blood, Kalamata olive, and white pepper. I've got 3 bottles on the way. Hopefully mine are as good as yours!